Well, I’ve had a chance to read it, and look through it again pretty thoroughly, so I thought I’d share my reaction to the book. Landscapes are Everywhere. This is just a short introduction type of chapter, so not much is covered here. Cameras and Accessories. Things to consider when you’re getting a camera, what megapixels mean, advantages/disadvantages of megapixels, what sensor size means, and other things to look for when getting a camera. Choosing and Using Lenses. Pros and cons of professional lenses, what lens speed will do for you, why zoom lenses are great for landscape photography, what filters you should use, and a detailed discussion of various focal lengths. Mastering Exposure. How to use the histogram (including the RGB one! ), introduction to the f-number series and why it’s important to know for exposure, great explanation of ISO values, overview of metering modes, how to avoid autoexposure problems, and more! Techniques for Sharp Images. This chapter was really awesome, as it introduced me to a lot of new ways to get sharp images (I won’t spoil the book and reveal them here, though!). The Gerlachs explain why you need a good tripod, why L-plates are great for landscape photos, how to deal with various types of terrain and conditions (i.e. wind, snow, soft ground, etc), and they even explain how to clean your sensor. Light on the Landscape. Overview of the different types of light and how filters affect it (especially a polarizer), overview of white balance settings, how to control high contrast scenes, and the importance of light direction (front vs side vs back). Composing Pleasing Images. Tips for composing images by spotting the most important aspects, horizontal vs vertical orientation, perspective, background choice, the rule of thirds, and how to use curves in your images. Special Subjects. How to photograph special subjects like waterfalls, fall color, and snowy landscapes. High Dynamic Range Images. I know HDR images are pretty controversial in nature photography, but I think the Gerlachs use HDR wonderfully, and as it was intended: to expand the dynamic range of your camera (and not produce fake looking scenes!). This chapter explains their technique for capturing HDR images. Panoramas. Probably everything you need to know about shooting some great panoramic photos! Not only does this book cover a lot of topics in great detail, but the Gerlachs have a wonderful way of explaining things in a clear and direct manner. They make the most complex things seem simple. The book also contains a lot of their wonderful photos which help illustrate some of their main points. I think this book is perfect for beginning to intermediate landscape photographers. If you’ve read basic books like Scott Kelby’s wonderful series and you’re looking for more, definitely check out this book! Help support us and buy the book through our affiliate link! If you’d like to buy the book, we’d greatly appreciate it if you used the Amazon link below. We get a small commission for each sale, which helps pay for the monthly server space for this site (and maybe a cup of coffee for me too, heheh). Thanks! 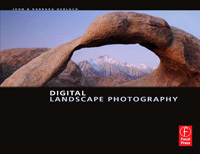 Buy Digital Landscape Photography on Amazon! Steve, thank you for this very helpful post. I think I’m going to ask for this for my upcoming birthday and use the link you provided. Heck, you provided a great review and I’d like to support that. I also appreciated your histogram post. I am a beginner landscape photographer and I want to learn all I can. Renee – Thanks, I hope your birthday wish comes true! 🙂 Happy birthday, btw! Steve – I had taken a day long seminar with the Gerlachs a few years back and was very impressed with the wealth of knowledge they shared. I also plan on purchasing this book through your link. Thanks for all your tips. I always look forward to receiving them. Hello Steve – I am going back to your essay on G. Rowell’s ‘Inner Game’; I ordered the book shortly after and I am poring over it slowly; REALLY SLOWLY. Perhaps this book is not quite meant for the younger generation fast readers. If I may quote just one food for thought: “Regardless of how perfectly a photographer”s work renders a subject, it is bound to fail unless it strikes that chord that elicits a common emotional and visual response.” What a wonderful reminder for me – a DSLR beginner aspiring to use his shots in his book. I suppose the emphasis is on “common”. By the way thanks for your tips on manual exposure coupled with auto-focus. I am beginning to manage. Could you help me on this, please: Focussing 1/3 into the scene (landscape), you estimate the 1/3 through the viewfinder or with bare eyes; should they be the same?